How Do I Explain Our Home Security System To My 5-Year-Old? 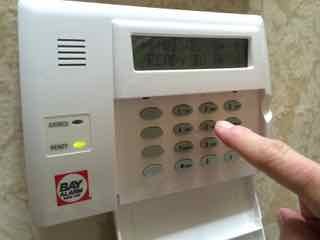 Home » Dad » How Do I Explain Our Home Security System To My 5-Year-Old? The morning routine is a solo process. Flip on the coffee pot, jack up the blind, feed the cat who’s been nudging at my face since dawn. The regimented process occasionally gets a 32-pound cog thrown into the well-oiled machine in the form of a 5-year-old boy. If the routine generates too much noise – and in my 100-year-old home a mouse farting can shake the foundation – a 24-pound cog in the form of a 2-year-old girl brings the routine to halt. On this morning, only the older cog heard the coffee dripping, shades zipping and mice farting. He shadowed each stop on the routine, the typical question of “why” following my trail. All simple answers to uncomplicated questions. The questions that followed disarming the home security system weren’t so elementary to answer. “It’s an alarm to keep all of us inside safe..
Now how to explain breaking and entering to a toddler? A kid that frightens at the mere mention of pending thunder and lightening but also harbors a deep fascination for the super villains in the pages of comic books and insisted on a zombie-themed birthday party. One wrong word and the kid would either never want to leave the house out of fear or imagine crime as a potential vocation. The line between what a child should know, to keep him safe, and what a child shouldn’t know because it will scar his psyche for life is fine. Perhaps the line is more than fine. Maybe minuscule? There are still secrets learned in my life – both as a child and adult– that affect the way I live my life. One afternoon, over a lunch of cold cuts and iced tea, my father and mother recounted the time a burglar broke one of the basement windows in a robbery attempt, only to be thwarted by the dead bolt on the basement door. I didn’t enter the basement alone for months after, every night checking the locks on the door before bed. A few months after moving into this hundred-year-old money pit, a neighbor retold the evening he arrived home late from work and noticed two men carrying furniture out of a neighbor’s home. Thinking it odd, he called the neighbor – she was fast asleep – and in that moment they both realized she was being robbed. Before he finished the story my wife was on the line getting estimates to not only alarm the house but dig a moat around the house and inquire about the cost per month of personal secret service officers. From that moment on, my Louisville Slugger by the nightstand was retired to just baseball purposes. But back to that fine line – there are things kids should know for their own safety (stranger danger and venturing out alone in public places) but exactly when and how to explain to a kid that the world isn’t all Disney princesses and good Samaritans like in their books? You want to prepare kids for the worst before the worst finds out they don’t always lock their back door or keep a spare key in a fake rock in the garden. You’re damned to evenings of nightmares if you do and, god forbid, something even worse if you don’t warn them that sometimes people do bad things to one another. Venom, an occasional nemesis of Spider-Man and the kid’s favorite villain, is the type of antihero who would break into a home to take an expensive desktop computer while we slept but he wouldn’t have to jimmy the door because the kid would open it right up for him. He pondered, bit into his Sunday pancakes, and explained how Green Goblin wouldn’t need to use the door, he’d just fly on his hover board and come through the windows. Thankfully his mother wasn’t within earshot or window alarm sensor installation would suddenly be on the “to do” list. Chris Illuminati is the creator of Message With A Bottle, the author of The New Dad Dictionary, and most importantly the father of two kids.